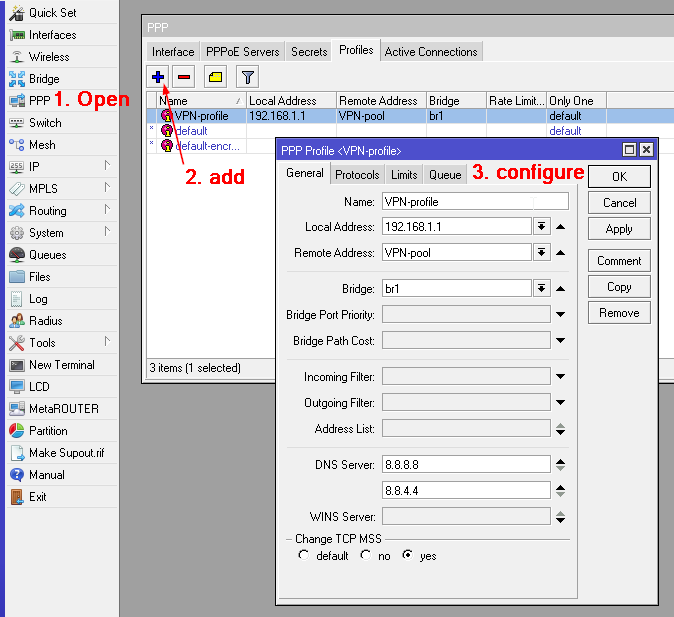 Before I started to wrote this post, I thought that would be nice to say some word about PPTP VPN and Mikrotik RouterOS, but then I realized that if you are reading this, there is no need to explain what is PPTP VPN server or Mikrotik RouterOS. If you need any help or I did something wrong, leave a comment and I will try to do my best to help you. Great guide. Can we allow specific hostname (not ip) to connect pptp server? Great guide, it helped a LOT! Hi there, how can we set the security/encryption level of our VPN server following this steps? I spent 6 hrs trying to figure out why I couldn’t communicate with computers on the local subnet. 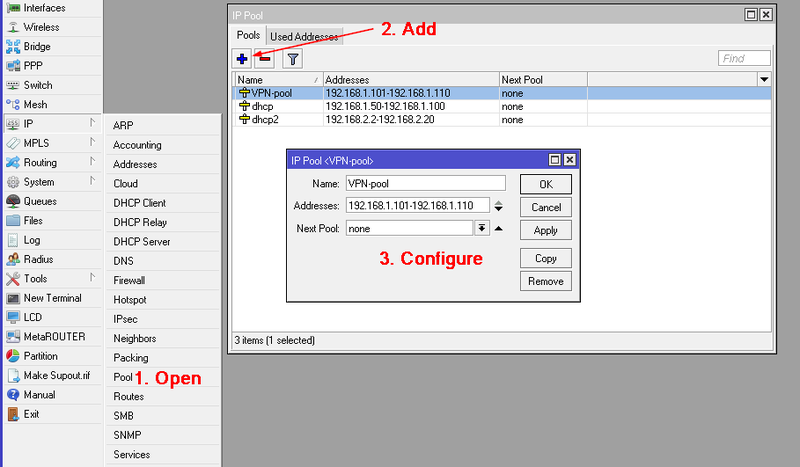 Hi, there is an mistake in your settings: local address and remote address should be both set to dhcp pool. If you set local address to 192.168.1.1 (gateway) you will cause loop in bridge interface and packet drops. 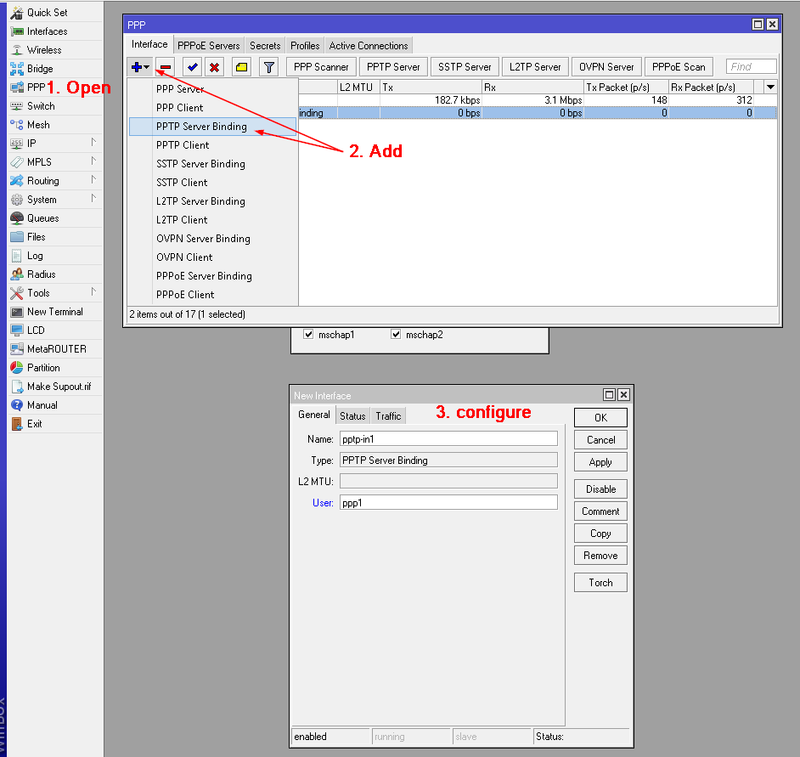 is this setting able to work with load-balanced 2 wan? Gostaria de saber se tem como fazer uma vpn entre um mikrotik com ip real da publica e um mikrotik com ip dinamico? I have used ddns and I am able to reach the router inside my network, but connection closed after username and password verfying appeared in my client. everything worked perfeclty!! but i loose the internet conection when i connect to the vpn,,, how do i fix it??? Hi, i don’t know if you stell working about this, but,i need some help. Is it possible to call server in LAN 2 from PC in LAN 1 via VPN with server name not IP address? I have VPN tunnel and I get to the server with IP but I need because of programs to connect server via name like SERVER_1. Yes,great question. IP access is working but names are not. Thanks for the great article. 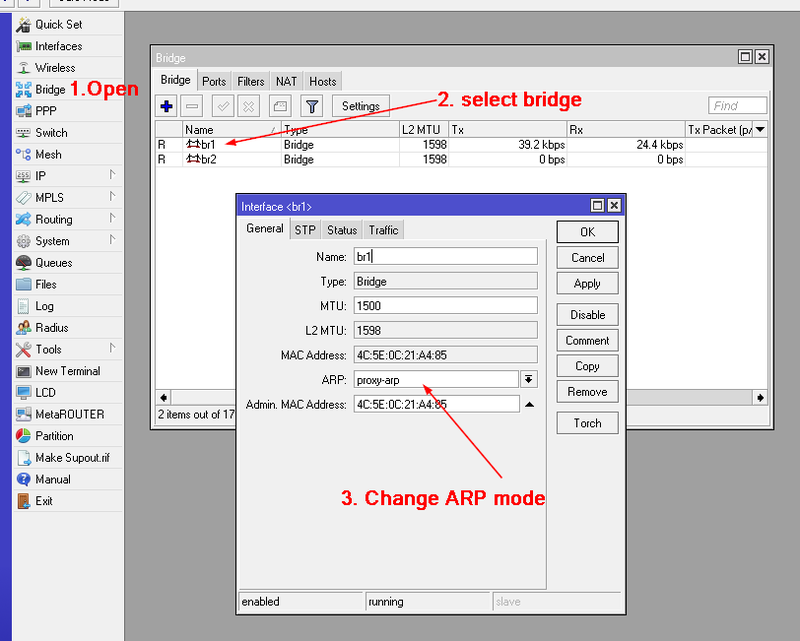 Yours is the ONLY guide I have come across which has explained how to configure the Bridge so that we can see other network devices. Have been searching for this info like crazy. Thanks a ton!